Dog Oil Painting on Canvess, Irish Water Spaniel, "Sweetie", 18"x18", by Mercedes Franklin, For Sale. 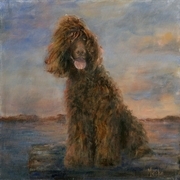 There is something about the Irish Water Spaniel that I love. They have great heads & expressions. Love their personalities. Actually there isn't anything not to like about them!